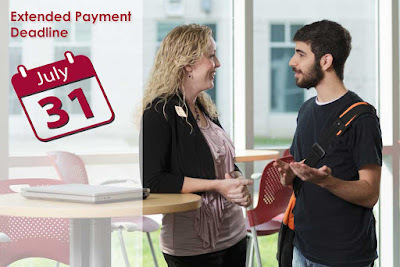 The College has extended the fall tuition payment deadline for pre-registered students in 15W, 12W, 8W1, and 4W1 sessions until Friday, July 31, 2015 due to delays in financial aid processing. This affects those who have preregistered since April 13 but have not paid. Students who have not paid tuition, enrolled in anautomatic payment plan or have anticipated financial aid and scholarships less than the balance due, will be dropped from their courses at midnight July 31. Students may pay online or in person. All new students registering after July 31 should plan to pay at the time of registration. To check the status of your student account, contact the 24/7 Financial Aid & Student Accounts Center at mysupport.germanna.edu or 1/855-874-6681.